That's the word of the day over at Merriam Webster and what a gorgeous word! I find it onomatopoeic in the best possible way. Apparently in the 90s, someone could convincingly play an alter ego by adding copious amounts of grease to one's hair. When I Googled the phrase "oily people", roughly 100,000 Google images of women with perfect, pristine skin on their faces and shoulders pops up to accompany thousands of articles written for those of us with oleaginous skin. I fully understand people turning to the internet for skin care advice. I also fully understand people using the internet for advice on the "avoidance of oily people". Poor Pete Campbell. I don't think it is an accurate word for him though. He isn't so much oleaginous mostly because he doesn't ingratiate himself after say, season one when he realizes Don Draper ain't having that, but also because he is more 1950s Yale grad in his looks than, say, Ratso Rizzo who surprisingly, wasn't on the first page of results. Though Rizzo is likely 10 times the man Pete Campbell could be. 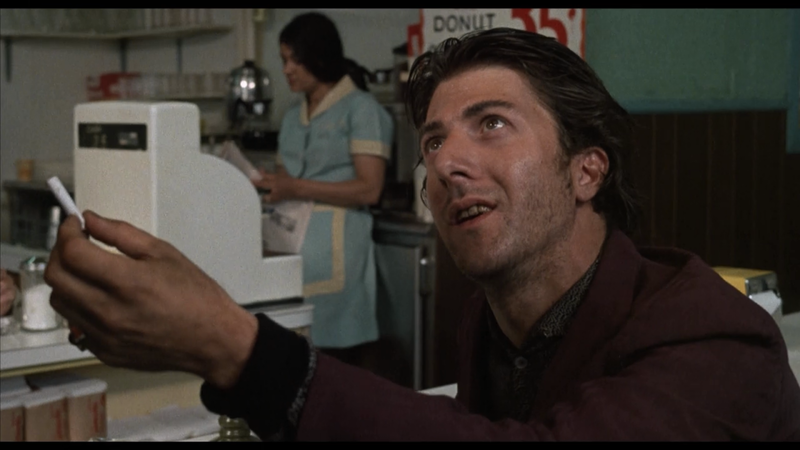 Also, I just realized that Dr. Joel Fleischman and Dustin Hoffman look very similar when they are oleaginous-i-fied. I think film and TV costume people honestly just add oil to actors' hair to achieve that sense. Bit on the nose, wouldn't you agree? Today's word of the day also got me thinking about the one truly oleaginous person I've met in real life. He worked in the stock room of a bookstore where I worked a million years ago in Greenwich Village. I won't say his name because it was very unique but let's just say it was Cronus because it was actually along those lines. If I had to come up with a slogan to honor my memories of Cronus it would be to say he was an oleaginous, narcoleptic, heavy-mouth breathing, creepy, simpering blob of a man. Every part of him was oily. He stood about 5 feet tall and brought with him a huge paunch that preceded him in every situation and atop of which he would rest his stubby, intertwined fingers while he proselytized about this or that, as though that belly was his podium and everyone in the world was his audience. Among many other things, he was known by the staff for breathing heavily and in the moistest way possible and for falling asleep often and without warning. One time I had to go to the stock room to ask him where something was and he pointed half-assedly in the general direction of where I should look. I returned less than 60 seconds later to find him deeply asleep in his chair, his breathing wet and loud. He would often disappear for large amounts of time in the staff bathroom which at the time most of the rest of the staff had to chalk up to the obnoxiously large amounts of food he consumed at lunch time. What was later revealed, however, is that Cronus, responsible for unpacking all newly arrived items to the bookstore, would take some of the racier editions of magazines and hide them in a small, nondescript corner of the bathroom. These secret artifacts were discovered after his dismissal for crimes, the nature of which I can't readily recall but cannot fathom were grosser than jacking it in the staff bathroom. They surprised almost no one. I never think about Cronus except for right this moment and I wonder whatever became of him. He left his oily trail on my memory apparently. In fact, I would think that if nothing else, someone who is oleaginous would be memorable to most people. I mean, they'd cringe in the remembering but that's something right? I'm currently paranoid that my hair looks oily and so will wash it thoroughly. Thanks for keeping me clean, Merriam Webster! By the by, Noah Webster looked like this and I'll let you pass your own judgement on his 'do.